Mega Millions is the American lotto that set a monumental $656 million world record top prize on 30th March 2012 — a record that stood for four years until the January 2016 $1.5 billion Powerball jackpot! Play the US lottery that offers a $40 million starting jackpot, a guaranteed $1 million second place prize and 1 in 24 odds of winning one of nine prize divisions. This American lottery came so close to breaking Powerball’s record on the October 23, 2018 as it mounted up to a staggering $1.537 billion jackpot! Buy Mega Millions tickets online for a chance to become the next Mega Millions millionaire and look forward to more exciting prizes such as this one! Mega Millions lottery holds the record for the its biggest jackpot of $1.537 billion in 23rd October 2018 when the multi-state US lottery became the world’s second lotto to cross the $1.5 billion dollar mark! In addition, this American lottery has created one $1 million first prize winner at theLotter so far! Check U.S. Mega Millions lottery results to view the most updated winning numbers for one of the world’s biggest lotteries. Tax Requirement Tickets for this lottery are purchased in New Jersey. Lottery prizes are subject to taxation at source. There are three tax bands. Tax Band 1: Tax-free up to $600. Tax Band 2: Any portion of the prize between $600.01-$5,000 is subject to a tax rate of 28%. Tax Band 3: Any portion of the prize exceeding $5,000 is subject to a tax rate of 25% (30% for non-residents). Prizes above $10,000 are subject to an additional 3% State Tax. Check the tax laws in your country of residence for any further local taxation you may be subject to. Multiplier Prizes Multiply any non-jackpot prize amount won by 2, 3, 4 or 5, depending on the Megaplier number drawn. Mega Millions set the world jackpot record on 30 March 2012 when it awarded a $656 million prize to three lucky winners from Maryland, Kansas, and Illinois. Three colleagues from Maryland’s public education system pooled their money in the draw and purchased tickets as the ‘Three Amigos’. The three won a third of this record Mega Millions prize; each of them became a lottery syndicate winner! This huge Mega Millions jackpot would remain the largest jackpot prize ever until Powerball’s epic draw in January 2016 with its $1.586 billion jackpot. Mega Millions awarded another huge jackpot on 17 December 2013 when two winners from California and Georgia shared a $648 million prize. The largest Mega Millions jackpot of all time was the $1.537 billion prize won by a single ticket purchased in South Carolina for the draw on 23 October 2018. That jackpot fell just short of breaking Powerball’s hold on the world record. There is no doubt that there are many huge Mega Millions jackpots ahead in the years to come. Check lottery results for more than 80 world lottos including the U.S. Mega Millions. In the US, players can purchase Mega Millions lottery tickets in Arizona, Arkansas, California, Colorado, Connecticut, Delaware, District of Columbia, Florida, Georgia, Idaho, Illinois, Indiana, Iowa, Kansas, Kentucky, Louisiana, Maine, Maryland, Massachusetts, Michigan, Minnesota, Missouri, Montana, Nebraska, New Hampshire, New Jersey, New Mexico, New York, North Carolina, North Dakota, Ohio, Oklahoma, Oregon, Pennsylvania, Rhode Island, South Carolina, South Dakota, Tennessee, Texas, US Virgin Islands, Vermont, Virginia, Washington, West Virginia and Wisconsin. On Wednesday, 15th May 2013, Florida joined 42 other states, the District of Columbia and the US Virgin Islands that already offered the US lotto giant. The Florida Lottery adding the multi-state game for players to enjoy, promises higher prize pools with the popularity of lotteries among Florida residents. Florida lottery fans, already fond of America’s other lotto behemoth Powerball, had been awaiting the arrival of the world-record holding Mega Millions for quite some time. Wyoming became the latest US state to join the Mega Millions team on 24 August 2014. At the outset, the Mega Millions only offered players the ability to play 5 out of 56 numbers, with an additional Mega Ball selected from a guess range of 1-46. In 2003, Texas led the way in prize innovation when it began offering the option to play the Megaplier, an optional prize feature that can multiply secondary wins by up to four times (now available to multiply prizes by up to five times). By 2011, all the Mega Millions states offered the Megaplier option. The lottery’s record jackpot of $1.537 billion reached the massive sum thanks to additional funds flooding into the prize pool as ticket sales in the participating states shot up dramatically. The Mega Millions jackpot was claimed by only lucky ticket holder on the 23rd October 2018, after the lottery’s results were published and the millions of tickets that had been purchased were checked. The winning Mega Millions tickets were sold in South Carolina. As of October 31st, 2017, the Mega Millions lottery introduced a change in the number guess range, for both the regular and Mega Ball numbers, an increase in the opening jackpot from $15 million to $40 million, a minimum of $5 million jumps between draws, a 5x multiplier feature and a 2nd place prize worth $1 million! All these changes contribute to an improvement in the overall odds of winning a prize from 1:15 to 1:24. 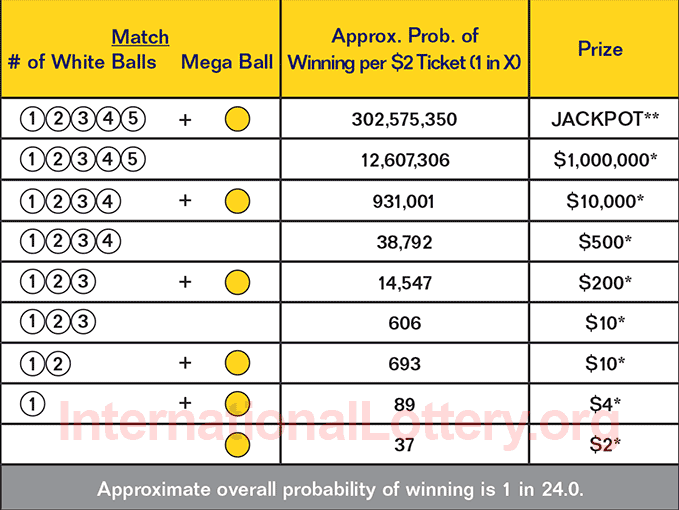 To play this US lottery, participants select five regular balls from a guess range of 1-70, as well as an additional Mega Ball from a separate number matrix with a guess range of 1-25. Mega Millions offers a multiplier option called the ‘Megaplier’ which can multiply secondary prizes by 2-5 times for tickets depending on the Megaplier drawn alongside the main draw. Players looking to increase their wins in this way should select the Megaplier when buying their Mega Millions tickets. A 5x multiplier can take the $1,000,000 Mega Millions second prize to a $5 million windfall for any player who matches all five main numbers having selected the Megaplier option! Mega Millions has nine prize categories; in order to win the jackpot players must match the first five numbers as well as the Mega Ball. If the winner is a US resident, income taxes are applied to jackpots. If the winner is a non-resident, taxes carry a 30% flat fee. Mega Millions’ record jackpot of $1.537 billion was claimed in 2018 by only one lucky ticket winner. Local Luck – In October 2009, T. K., who had recently registered with theLotter, became the lucky winner of the second prize in Mega Millions, taking home one quarter of a million dollars! While T.K. didn’t have to travel far to collect the $250,000 US lottery win, this big winner was assisted by theLotter’s customer service staff throughout the entire process. Swiss Bliss – N.B., a Swiss resident who used theLotter to play USA Mega Millions online, won US$250,000 in April 2011. This lucky player purchased a ticket for the Mega Millions drawing that was going to be held the very next night. While the winner missed the Mega Ball required to win the Mega Millions jackpot, he certainly wasn’t complaining about a 2nd place prize of $250,000 for matching the other five numbers correctly! After theLotter notified the player about his big win, he was asked to provide several forms of identification prior to ticket collection in New York City. Upon arrival in New York, the winner met with theLotter’s local representative and attorney to receive his winning lottery ticket and then proceeded to the official Mega Millions local office to claim his $250,000 prize! Already aware of what to expect regarding the location and hours of operation of the Mega Millions thanks to online lottery ticket provider theLotter, the lucky winner collected his check without a glitch! Third Time’s The Charm -B.G. from Spain took home the second place Mega Millions win of US$250,000 in March 2012, making him the third theLotter customer to claim this prize from the world-famous American Mega Millions lottery. The lucky Spanish player has been a member of theLotter since 2009 where he enjoyed all the biggest lottery names from the comfort of his home. He was pleased he had decided to follow the multi-state lotto jackpot as it grew by leaps and bounds and especially pleased to see his numbers come out. Following his win, B.G. was immediately informed by theLotter’s customer service team that his five lucky numbers (1, 4, 6, 11, and 14) made him the recipient of the $250,000 prize in addition to four 5th place prizes of $150 for four correct guesses (4, 6,11,14 ) in four other tickets! The Never Ending Rollover – Mega Millions amazed fans as the lottery’s top prize sped past the half a billion dollar mark all the way up to a $656 million prize by the time it was claimed by three lucky winners on March 30th, in draw 2012/26. When the lottery’s $363 million jackpot was left unclaimed in draw 2012/25, the lottery offered a $476 million prize for the next draw; however, record-breaking ticket sales pushed the estimated jackpot prize even higher. In a matter of days, Mega Millions grew from $476 million, to $500 million, $540 million, $640 million, and was finally declared a prize of $656 million after all ticket sales were tallied after the draw! In total, 1.5 BILLION lottery tickets were sold for the draw. Twice the Luck – In November of 2003, Stephen Cook was thrilled to find out he had won the $70 million Mega Millions jackpot. When he got to the Atlanta headquarters he was told two other players had also won so he would be sharing the sizable prize with them. However, when the lottery officials checked the winning names they were shocked to see Stephen Cook’s name twice! Apparently, Mr Cook hadn’t realized he’d purchased his tickets (with the same numbers) twice, thus entitling him to two thirds of the win, or two checks for $23.3 million! All About Family – While winners traditionally come with one or two other people to collect their big wins, Margaret Jones shocked Mega Millions lottery officials in 2005 when she arrived to the Atlanta headquarters with her entire extended family in a large luxury bus singing and cheering. The group took turns holding the $130 million check on the bus home, celebrating the whole way. Players who love the Mega Millions may enjoy playing other lotteries that draw on the power of multiple states and countries. Play the European EuroMillions, or see if U.S. Powerball numbers are worth more than Mega Millions in 2013.